This is Benefit's cream eyeshadow/liner in 'Birthday suit.' I use it every day pretty much and it works wonders. 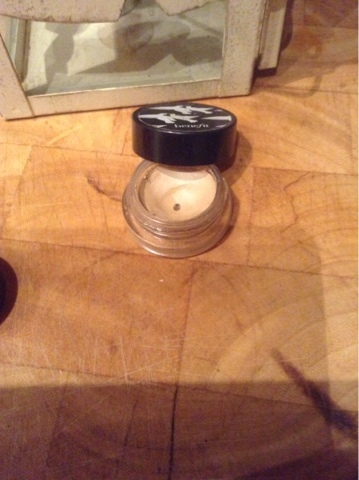 It is a great eyeshadow base with its creamy texture and also for highlighting under the brow..
Too whack it up a notch, I dab a small amount of it over my cheek bones for extra illumination!! It comes in quite a few colours and they're all really pretty. Also, if I'm running late and want an all over colour just to cover the lid with, I use this as it completely smoothes out the eyelid and gives a gorgeous gentle shine and lasts all day. It would work great on different skin types, however if you tend to crease a lot throughout the day, apply an eyeshadow primer to your lid prior to applying this product to keep your shadow looking luscious for longer! Have you tried this product? Let me know on Twitter or Instagram me a photo! don't forget to follow Blushous Beauty too!